13 Nights Cape Town, Winelands, Garden Route & Eastern Cape plus Optional Two Day Wildlife Safari extension. 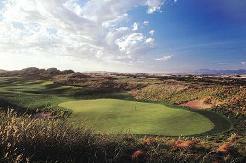 Tour begins with 4 nights in Cape Town including Golf, sightseeing excursions and wine tour. 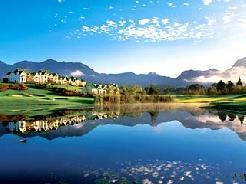 Then we set off along the Garden Route for golf at Pinnacle Point (2 Nights), Fancourt (3 nts. ), Plettenberg Bay (2 nts.) ending in Port Elizabeth (2 nts.) where we play Humewood Golf Links. Optional 2 Nights Safari Extension available. 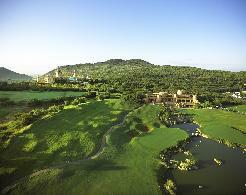 Scenic splendour and a selection of the best coastal golf courses in South Africa - all in 14 days. From Cape Town and its stunning beauty to the Garden Route and its spectacular golf courses and scenery, this is a superb tour. 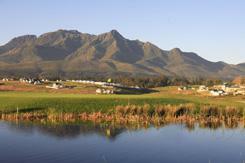 Play 10 rounds of golf including Fancourt which hosted the Presidents Cup in 2003. Tour ends in Port Elizabeth with an opportunity of a wildlife safari extension at Lalibela Game Lodge in the malaria-free Big Five Reserve (optional extra). If this itinerary does not meet your specific needs, contact us and we will prepare a custom made tour for your group. On arrival at Cape Town International Airport you will be met by your African Sports Safaris Golf Guide who will assist you with your luggage. Transfer to your hotel and check-in. Relax after your flight and this afternoon your guide will give a short orientation tour of the city. After Golf we visit Table Mountain and Lions Head. After golf we take a tour of the Cape Peninsula down to The Cape Point Nature Reserve and Cape of Good Hope. On our return we will visit Simonstown and stop at the natural penguin colony at Boulders Beach, Kalk Bay and Chapman's Peak Drive. 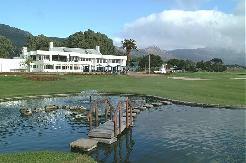 Today we set off for 18 holes at De Zalze Golf Club followed by some wine tasting at one of the local Estate's. Check out after breakfast and we depart down the Garden Route via the N2 highway to Mossel Bay and the spectacular Darren Clarke signature - Pinnacle Point course, overlooking the Indian Ocean. Afternoon at leisure to rest after the rigours of golf or hone your game at the Practice Range. Relax this afternoon in the spa at Fancourt. Afternoon at leisure at Fancourt or perhaps you would like to spend some time on the state of the art Practice Range to groove your swing? 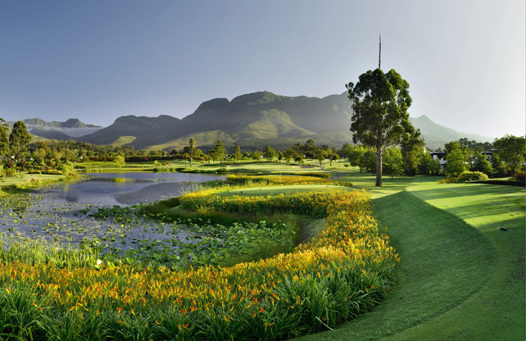 Afternoon at leisure at Fancourt which has a whole host of other attractions, including excellent chipping and puttings facilities, tennis, horse riding, gymnasium, spa and more. Or perhaps you would like to just chill out at the 19th hole Sportsman's Bar. Check out of Fancourt and we drive the hour and a half drive via the scenic lakes to the holiday mecca town of Plettenberg Bay. En route we will stop off for an extended look around the quaint town of Knysna to explore this beautiful estuarine town, famous for its cultivated oysters. surrounded by both sea and lagoon with direct beach access. Relax at the hotel or spend the afternoon on the pristine beaches of Plettenberg Bay. Or enjoy a boat ride to view the dolphins and whales that frequent the Bay (opional). 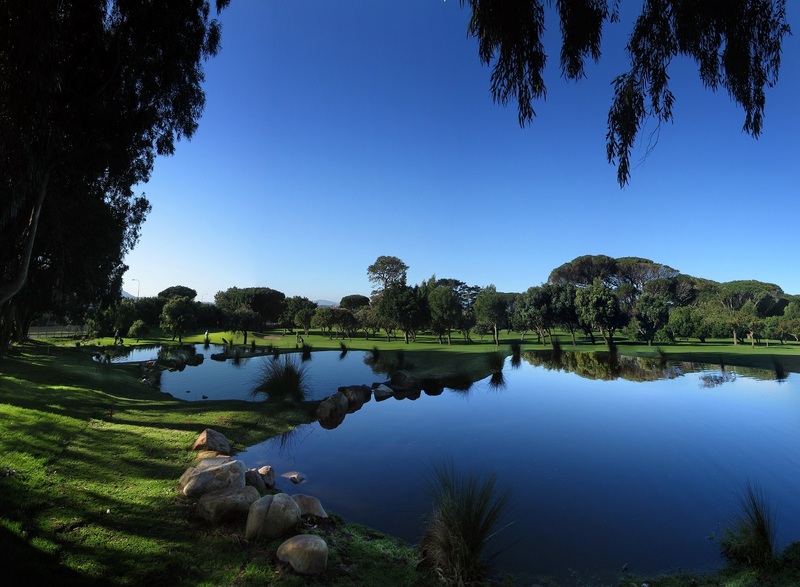 After golf we take a leisurely drive eastward along the Garden Route to Port Elizabeth where we check into the Paxton Hotel. This evening we spend exploring the sea front and Boardwalk entertainment area. This afternoon we take a tour of Port Elizabeth and learn some of the history of this 1820 Settler Town. Final Night Dinner at one of P.E. 's best restaurants. Transfer to Lalibela Game Reserve for a two day big five safari. An evening and morning Game in open vehicles are conducted daily with an experienced ranger who will share his/her vast knowledge with you. Return to Lalibela for dinner. Check out of the lodge and spend the rest of the day relaxing before your transfer to Port Elizabeth Airport in time for your flight home. Please remember - If this itinerary does not meet your specific needs, contact us and we will prepare a custom made tour for your group.